The Wi-Fi server is an excellent choice for connecting Auper metering systems and liquor dispensers to a wireless LAN using 802.11 b/g technology. With wireless connectivity you can eliminate the added cost and headache associated with running serial cables. The Draft manager Live or Liquor manager Live software will be able to access the systems from anywhere over a wireless network. A Wi-Fi server can be connected directly to the RS-422 or RS-232 port of the Auper system including an AP821 hub used to group several systems connected to it. The AP821 hub is designed to connect several Auper control systems to the same serial port of a computer running an Auper software. The AP821 has eight insulated RS-422 input ports, one RS-422 output port to connect it to another hub and a RS-232 port to connect it to the serial port of your computer. The output port of one AP821 hub can be connected to the input port of another AP821 to expand the RS-422 network. The distance between two RS-422 devices can reach 3000 meters. The AP821 has been used in stadiums to connect multiple flow meter systems that are very far from each other. Hundreds of flow meters are connected to the same software for a seamless operation and totaly integrated beverage control system. 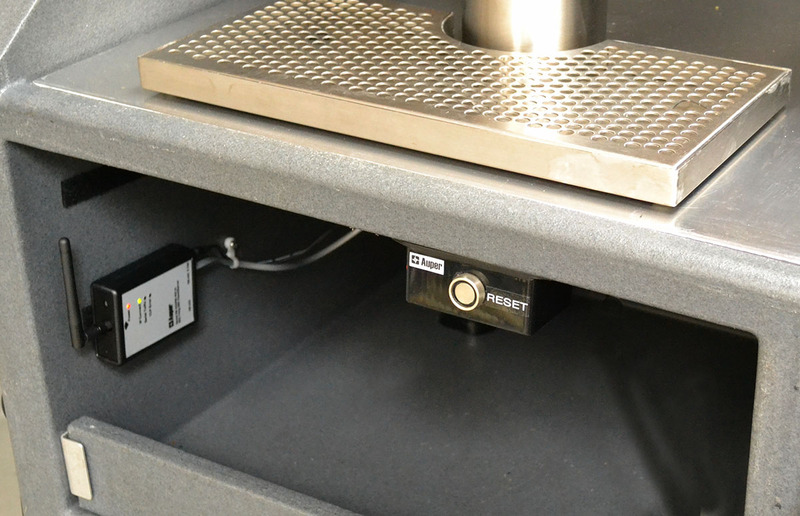 The AP821 hub is used to connect several liquor systems to the same serial printer or to interface more than one liquor or draft beer dispenser to the same point of sale terminal. The output of a hub can also be connected to a Wi-Fi server to connect several systems from one bar to the network.